We know you love Qdoba food, and we are excited to say that we now offer catering! Yes, the Mexican food you love to spoil yourself with is now available for you to share with your hard working employees, loyal church members, or winning sports team. Our Extras Will Make Your Day! If you need more 3-Cheese Queso (and let’s face it, who doesn’t) just order an extra one. One catering ‘serving of our delicious 3 Cheese Queso contains 20 servings. Choose your own flavor of rice. You can choose from Cilantro-Lime or seasoned brown rice. You can order 20 servings of our delicately seasoned fajita veggies to make any Mexican meal complete. You can order extra black beans or pinto beans too if you need more. Maybe you are feeding a lot of teenagers or vegetarians? Be sure to order extra beans! Let’s face it, there is no such thing as too much guacamole when it comes to Mexican food. When you order your Hot Nacho or Hot Taco Bar, you should probably get extra Qdoba hand-smashed guacamole to keep your guests happy. Extra salsa is always in demand. Order extra Salsa Rojo, Salsa Verde and Pico de Gallo for your catered event. If you have daredevils in your midst, try the Fiery Habanero Salsa. It’s extra hot! You have to have drinks at your catered party and we can provide sweet and tart lemonade and iced tea. Make yourself an Arnold Palmer to cool your mouth off after you try the Habanero Salsa! 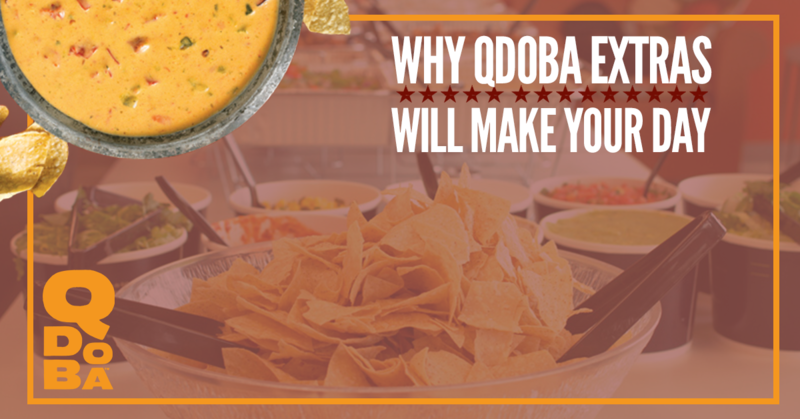 We are proud to offer world-class Qdoba catering to Cheyenne. Call today and reserve the date for your next office party or extended family get together!